Having problems with networking in VMWare’s Fusion? Here’s one possible cause and it’s associated fix. I was having network problems with Vmware’s Fusion (version 2.0.1) — Net BIOS / WINS name resolution failing, occasional long pauses in data flow, and slow startup of the networking in the VM after a suspend. The fix is t go into the virtual machine’s settings, select Network and then change the setting from Share the Mac’s network connection to Connect directly to the physical network (bridged). This results in your virtual machine DHCPing etc. 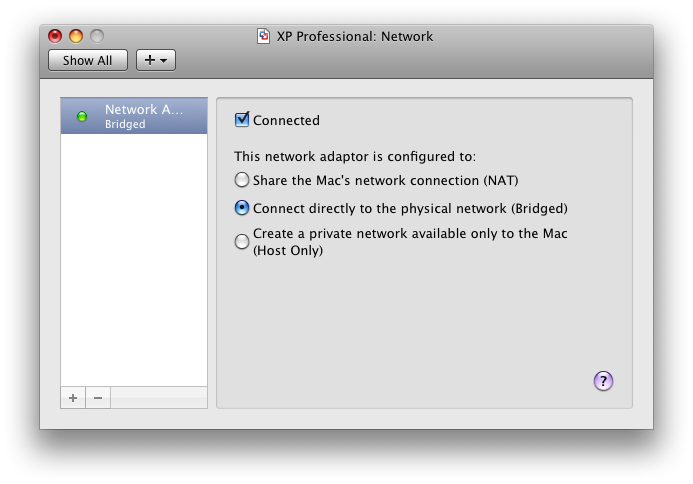 in the same way as the Mac, rather than straining your VM’s networking through NAT running on the Mac. If your network provides DHCP then changing the above setting may result in better, more robust networking.